Take it to the next level! Experience the deep peace of a “freefall” and the buzz of completing a deep dive. 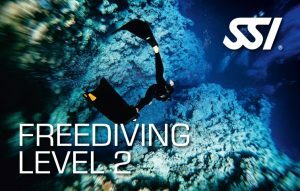 The SSI Level 2 Freediving course will equip you with further knowledge of the mammalian dive reflex and how to initiate the best response for Freediving. You will learn advanced equalization techniques, work on longer breath-holds, understand how to use your change in buoyancy during a dive to be more efficient on deeper dives, learn new training methods, and develop the skills necessary to freedive beyond 20m to depths of up to 30 meters.